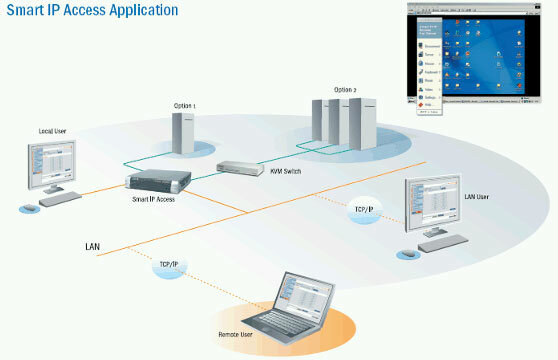 The Minicom by Tripplite Smart IP Access is all you need to add KVM control via IP to your servers. The 0SU51068 provides remote KVM access via LAN, WAN, or Internet connections to either a single server or to mixed server environments via an existing KVM switch. The Minicom by Tripplite 0SU51068 Smart IP Access provides built in remote control over two Serial devices. For example, Serial control of power management allows you to reboot remotely and to power servers on and off from any location. Compatible with all Minicom by Tripplite KVM switches, Smart IP Access also provides hundreds of predefined legacy KVM switch definitions, allowing easy configuration for remote KVM access to most servers. Smart IP Access offers a variety of encryption protocols to prevent security breaches, including AES (up to 256-bit) and 3DES. In addition, the dual IP connection can be deployed to take advantage of an existing network means of redundancy or security. High Security: Data Encryption based on 128-bit SSL. Create unique SSL certificate. Two Serial Ports: Control a power switch and a headless server while both devices are connected. Brower Based: Control and manager your servers from anywhere in the world. High ROI: As a tech service provider - save direct costs on travel and logistic expenses. Save on your investment. Preserve existing installation. Pre-Defined Settings: Seamless control of most KVM switches available. Just select and connect. KVM.net Compatible: Control all hardware and user administration through a single centralized system.